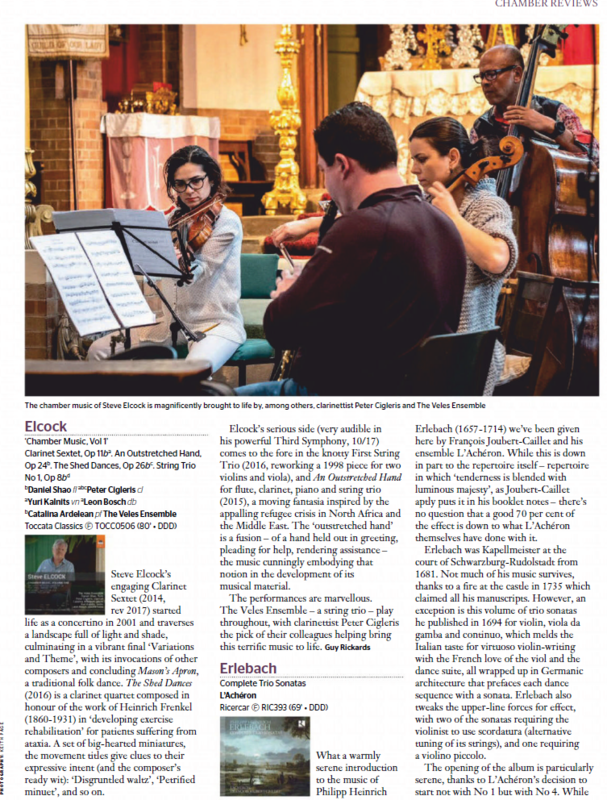 We are excited about our review in the Gramophone Magazine for our new Toccata Classics CD: Steve Elcock – Chamber Music Vol. 1. 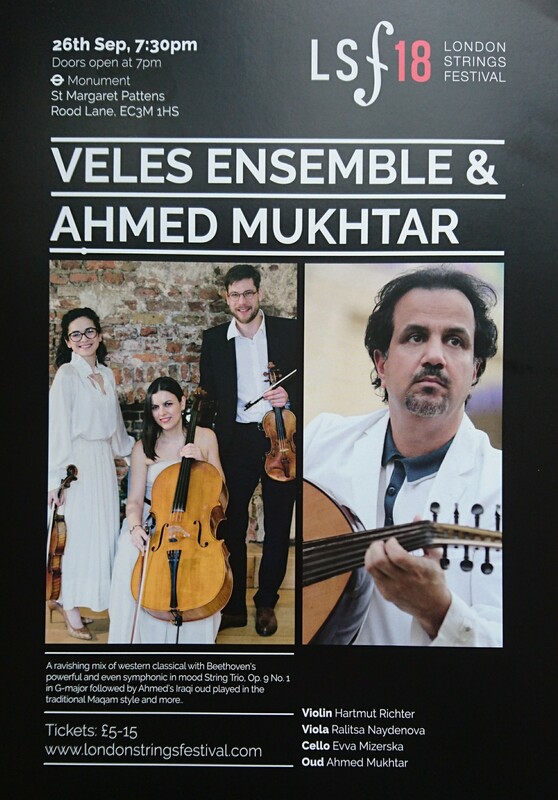 Upcoming Veles Ensemble string trio concert with Ahmed Mukhtar at the London Strings Festival! The trio will play Beethoven and Kodaly and then join Ahmed Mukhtar in his set of Iraqi oud music. The Veles Ensemble will open this evening of contrast with a true classic: Beethoven’s String Trio Op. 9 No. 1 in G-major. The trios Op.9 – published in 1798 – are often considered to be one of Beethoven’s most important early works. The G-major’s powerful and even symphonic qualities, wide melodic lines, contrasts and the breathtaking vigour of the finale leave no doubt about its historic significance. It is followed by Zoltan Kodály’s Intermezzo, a wonderfully fresh and light scherzo, written by the then 23 year young composer while finishing a dissertation on the Hungarian folk song at the Budapest academy. Not surprisingly, it combines the spirit of the Hungarian folk song (but without the clyché!) with the depth and sophisticated textures reminiscent of Dohnányi, whose Serenade for string trio served as a model for this short and entertaining delight. Ahmed Mukhtar will continue the evening presenting Iraqi music with Oud solo’s. He will then be joined be Veles Ensemble to finish with arrangements of his own compositions. 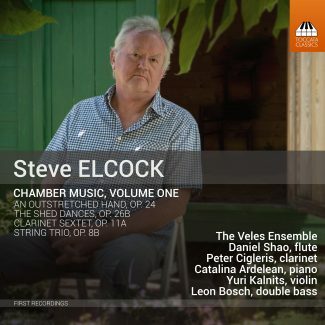 We’ve been busy recording a CD for Toccata Classics with music by British composer Steve Elcock. 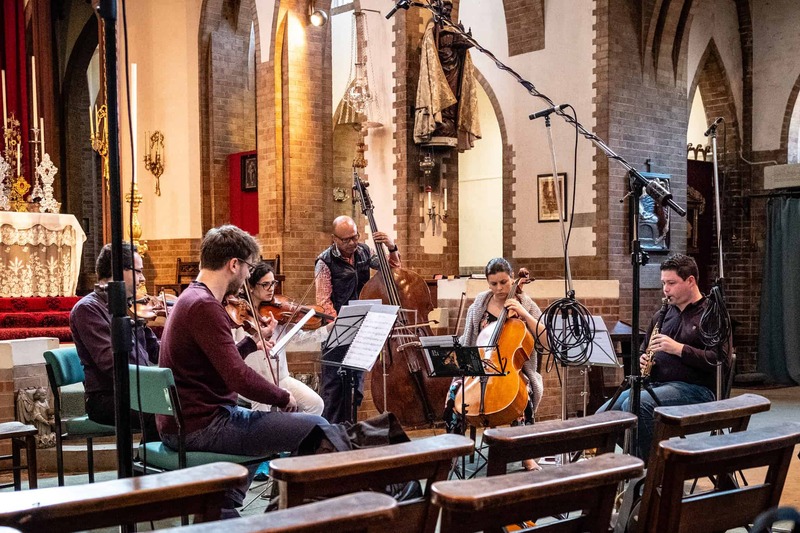 It was a great pleasure working with Michael Ponder as engineer and Peter Cigleris: clarinet; Daniel Shao: flute; Catalina Simona: piano; Yuri Kalnits: violin and Leon Bosch: Double Bass! We can’t wait for it to be released! 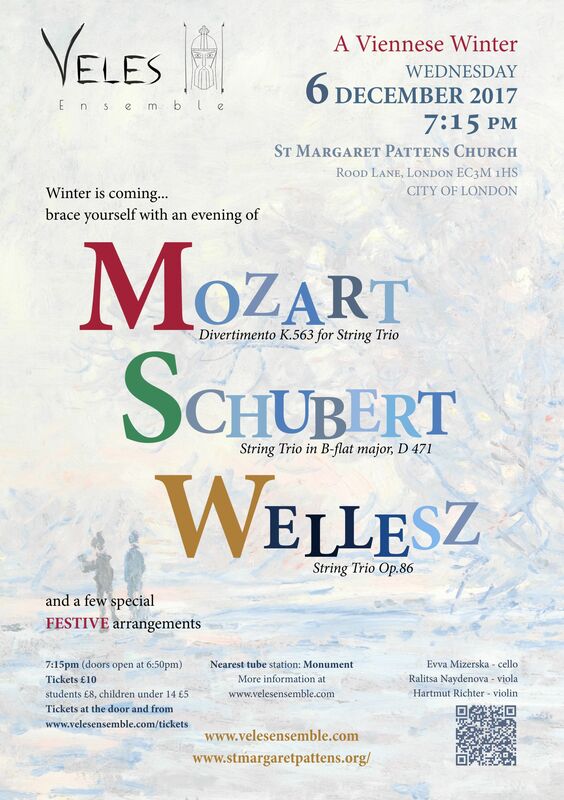 Join the Veles Ensemble for a night of exciting and varied string trio music: Mozart’s legendary Divertimento K563, Schubert’s B-flat major string trio, Egon Wellesz’ dynamic 20th sound world and a few special Christmas arrangements in the beautiful setting of St Margaret Pattens Church. 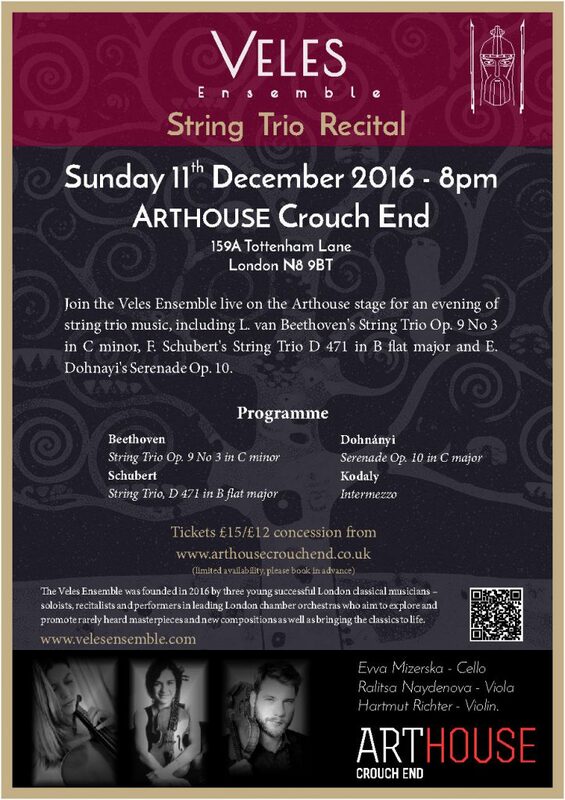 Below you can listen to a live recording of the Beethoven string trio Op.9 No 3 in C-minor from our pre-christmas concert at the Arthouse, Crouch End, London. Many thanks again to our fantastic audience. Secret Chamber Music - Christmas special. The Veles Ensemble string trio perform classics as well as a set of Christmas specials. The Veles Ensemble will open this evening of contrast with a true classic: Beethoven's String Trio Op. 9 No. 1 in G-major. The trios Op.9 - published in 1798 - are often considered to be one of Beethoven's most important early works. The G-major's powerful and even symphonic qualities, wide melodic lines, contrasts and the breathtaking vigour of the finale leave no doubt about its historic significance. It is followed by Zoltan Kodály's Intermezzo, a wonderfully fresh and light scherzo, written by the then 23 year young composer while finishing a dissertation on the Hungarian folk song at the Budapest academy. Not surprisingly, it combines the spirit of the Hungarian folk song (but without the clyché!) with the depth and sophisticated textures reminiscent of Dohnányi, whose Serenade for string trio served as a model for this short and entertaining delight. Ahmed Mukhtar will continue the evening presenting Iraqi musicwith Oud solo's. He will then be joined be Veles Ensemble to finish with arrangements of his own compositions. 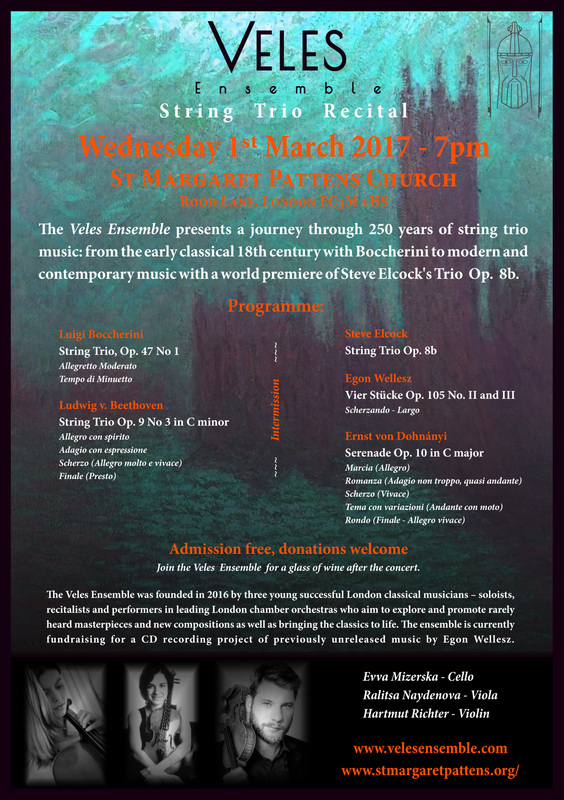 The Veles Ensemble presents an evening of classical string trio music with a twist of Piazzolla's fiery South American tango. 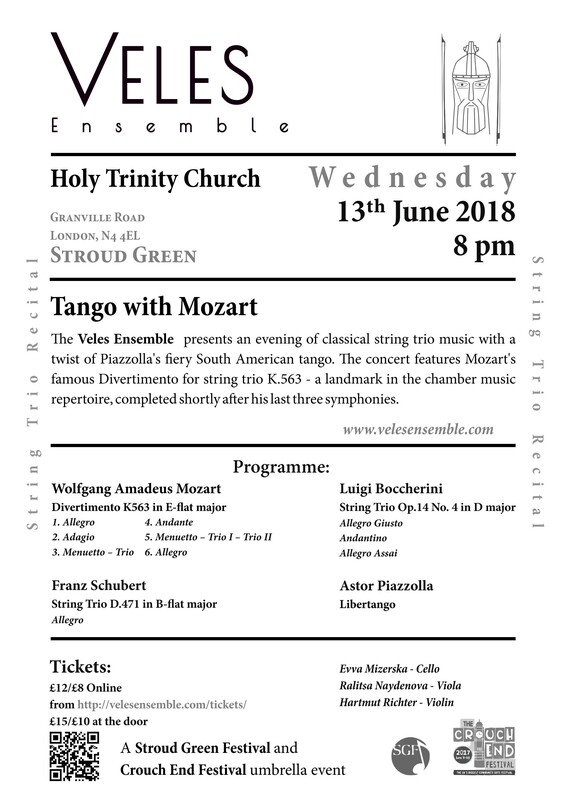 The concert features Mozart's famous Divertimento for string trio K.563 - a landmark in the chamber music repertoire, completed shortly after his last three symphonies. Recording session with chamber music by Steve Elcock for Toccata Classics. Join us at 7pm for an evening music, poetry, and community presented by David Swick and The Veles Ensemble. and a few Christmas specials. The Veles Ensemble presents music from Austria and Hungary. 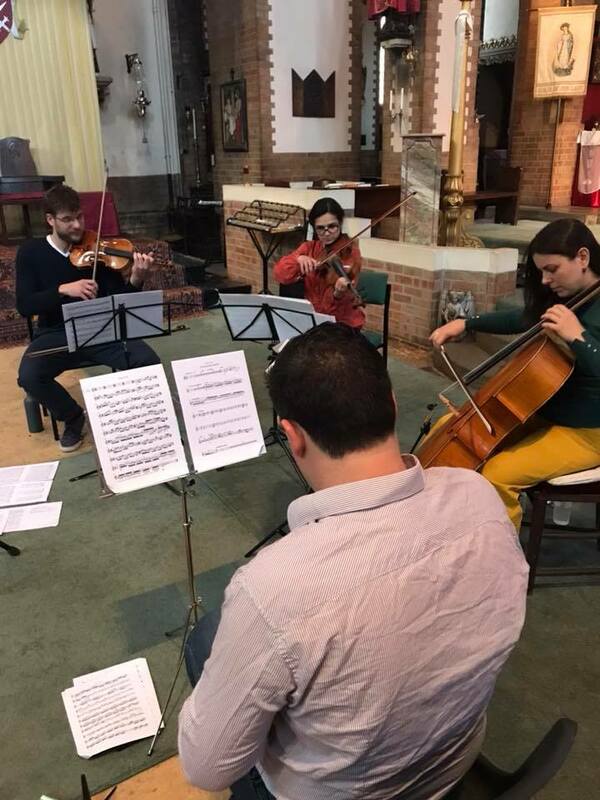 The concert will explore musical ties between these two countries of very different cultural backgrounds, yet connected historically. From Haydn to Wellesz through Kodaly and Schubert, the evening promises to be an intriguing mix of well-loved classics with a Hungarian folk music inspired twist.